You’ve been cleared for take off and you can now Take To The Skies with this fun puzzle from Ravensburger! 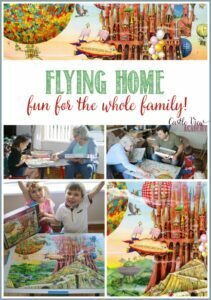 When the opportunity to review this puzzle came up, we were very enthusiastic about it as there are some aviation lovers in the family; and it also makes a great Father’s Day gift, if you’re looking for something to keep Dad busy! 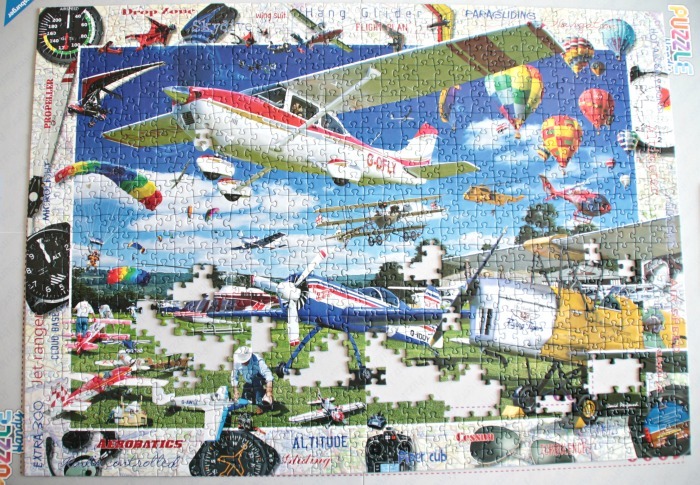 I personally dedicated this particular puzzle to my friend, Bob, a pilot who lost his life while flying a few weeks ago. Coincidentally, I found out that the day we began this puzzle his ashes were scattered. Bob always had a kind word and a bit of humour for me, and so I thought of him as this was constructed. Phil and the kids have made it a family tradition to attend the two air shows each summer here in Northern Ireland, not missing a show in the past 8 years! I don’t always go, but do enjoy it when I am able to go along as well; and just as an airshow only lasts a weekend, that’s all the time it took us to complete this puzzle, too! I started with the frame before heading to bed on Monday. 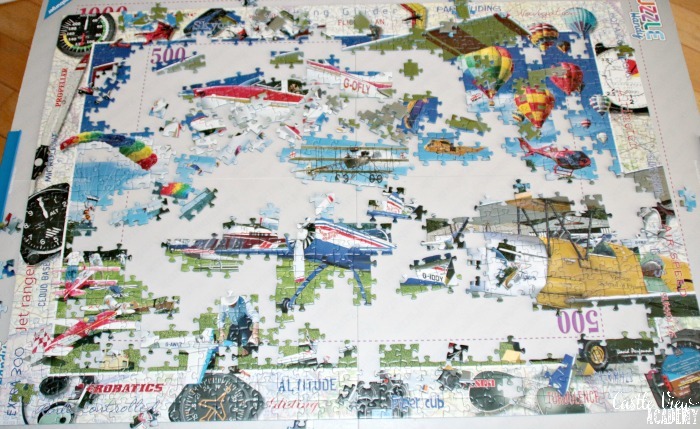 Tuesday morning I found a little time again to sit and begin putting together the remainder of the frame that was three pieces deep around the edges of the puzzle. 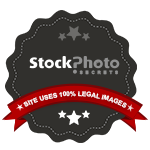 Then I began working on some of the aircraft. The mustard yellow was distinctive, the hot air balloons were colourful easy to place, as well as the remote control planes and the biplane and rescue helicopters. Because there were so many objects with distinctive colours and patterns, these were quite easy to put together and formed a good portion of the picture. I was on a roll! Tuesday afternoon the kids sat down to help as well to take a break from school. They were helping with some of the sky and grass in this picture, and they did quite a good job; as they get a little older you can notice their skills increase. 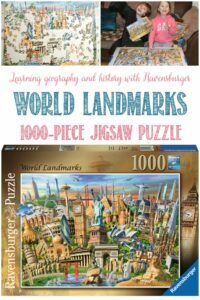 Puzzles are a great way to exercise those visual-perception skills! Kallista had a great strategy of actually matching up the shadows cast on the grass and finding the pieces in the picture and then clicking them in on the puzzle itself. 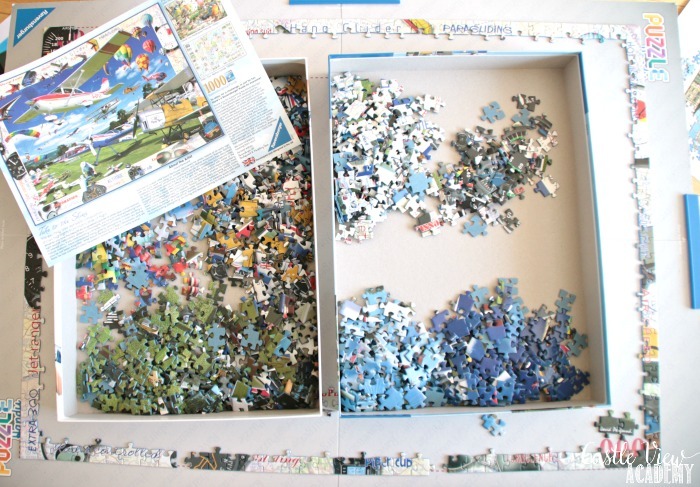 You can see back on the sofa is a page that was included in this box that has puzzle picture on it so you don’t have to crane your neck upside down to view the photo on the box top that is inevitably used to hold the pieces. 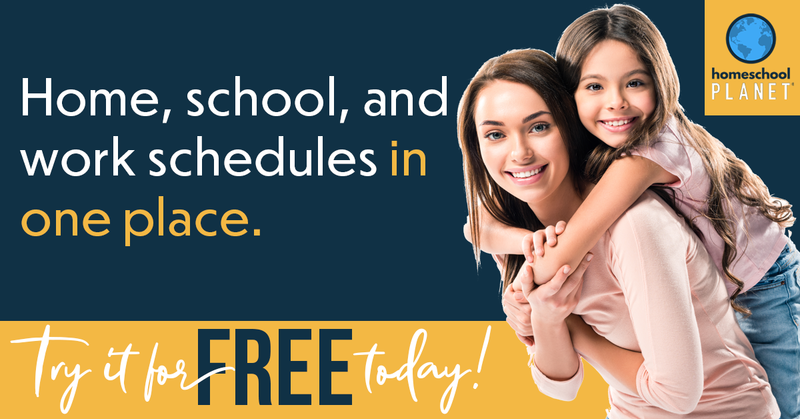 I love when those are included! How many of these aircraft can you identify? 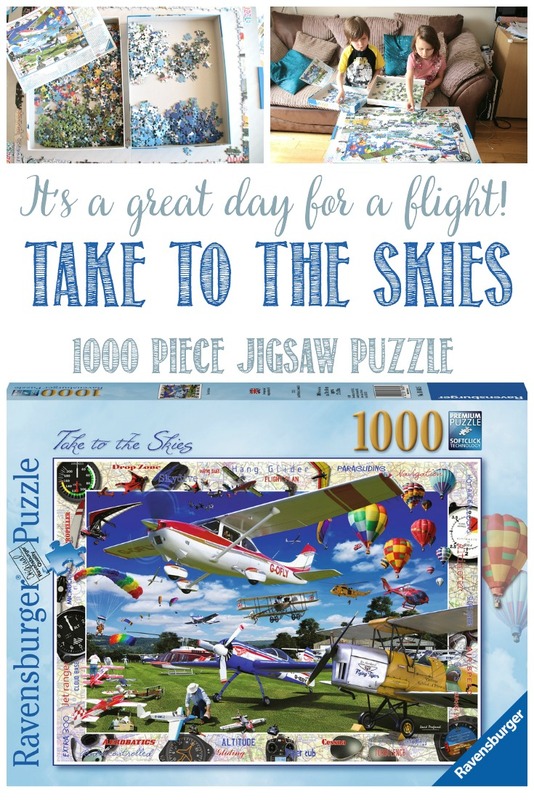 By Wednesday morning most of the puzzle had been completed and I continued to work on the sky while the kids prepared their questions for an interview they had with a member of our police force; perhaps I’ll share a little of that experience another day. To escape the heat of the day (May was the hottest May on record-wasn’t it great?!) 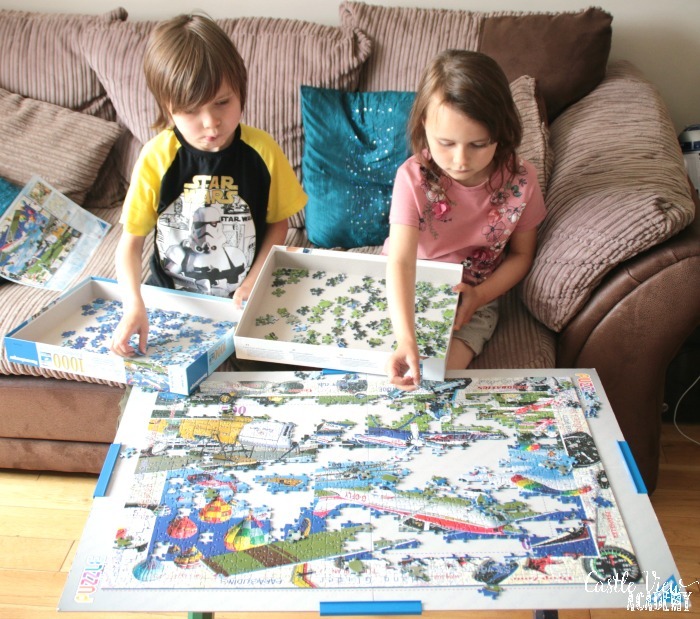 the kids hopped indoors and completed the puzzle themselves. 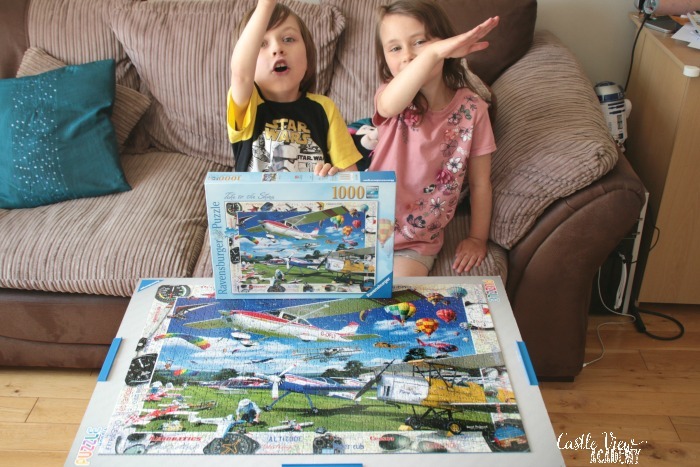 Yes, my kids can be a bit crazy at times, and insisted on hamming it up while I was taking a photo of the finished puzzle! But we all need to be a little crazy at times and enjoy life when the skies are clear as you never know when the clouds will make an appearance, so Take To The Skies and enjoy life! 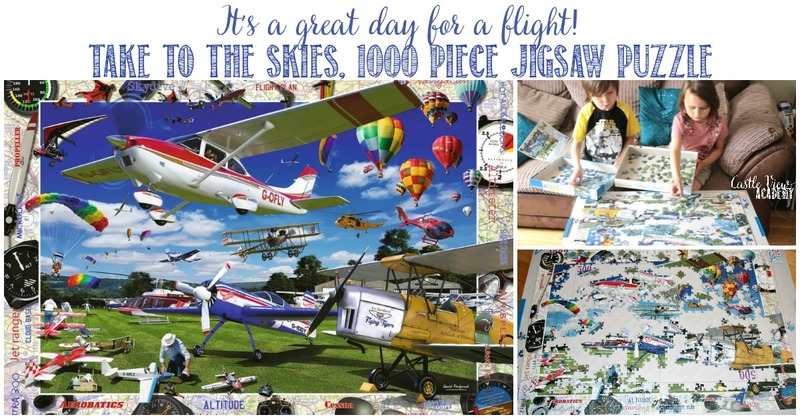 Ravensburger Take To The Skies 1000pc Jigsaw Puzzle is available through fine retail stores and Amazon.co.uk. 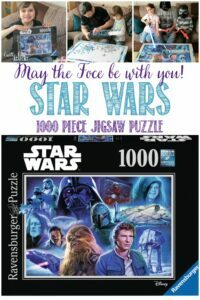 The Ravensburger Puzzle Handy is also available from Amazon.co.uk , Amazon.com and retail outlets. 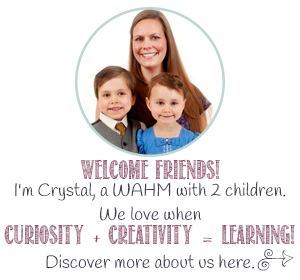 Follow Ravensburger through their website, Facebook, and YouTube.